This is the tallest waterfall in the United States. 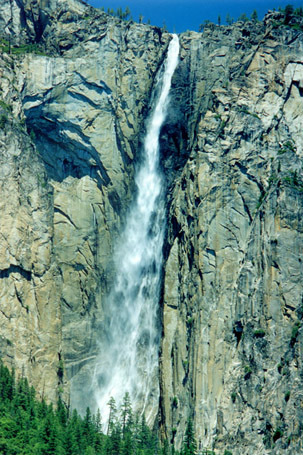 Some think Yosemite Fall is taller, but it is actually two waterfalls separated by a cascading rapids. Ribbon Fall is also located in Yosemite Valley. Ribbon Creek drops 1,612 feet over the granite cliff. That's over a quarter-mile! Peregrin Falcons like to nest up there, where almost nobody can get at them.